Fly fish the Bighorn or the North Platte River of Wyoming in one of our drift boat rentals. Wyoming Anglers of Casper, Wyoming is located on the North Platte River, home of the Miracle Mile and Grey Reef trout fisheries. A perfect way to learn the North Platte River is to hire a guide then get a Grey Reef drift boat rental the second day. Check out our new fully loaded Grey Reef drift boat rental packages with rods, lunchs, and drinks included. 1.) We have went to the expense to provide you the nice light guide oars that make rowing easy and we’re the only outfitter to offer these. 2.) We are flexible! We understand you may come wanting the convenience of picking up your Grey Reef drift boat rental the night before, so we make it available. 3.) We understand you’ll probably want to fish every minute of daylight, so we allow our Grey Reef drift boat rentals to be returned after dark. 4.) Our shop is conveniently located on the edge of Casper on the way out to the Grey Reef or Miracle Mile. 5.) Quality drift boats for the most reasonable price around! There are several advantages to getting a GreyReef drift boat rental over wade fishing the North Platte River. Because you get long drifts with your flies in the water longer, drift boat fishing is usually much more productive. Many of the best places to fish can only be accessed by boat. In Wyoming the water is public but the riverbed is the landowners. By floating you can access all the water that you can’t access by wading the small portions of public. 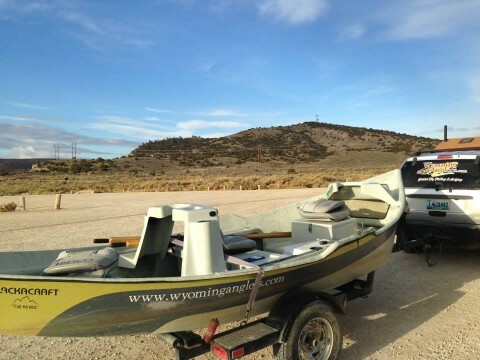 Keep in mind that the quickest most successful way to learn the river is to hire a professional guide at Wyoming Anglers, then get a drift boat rental the second day after you’ve learned a few things. We do offer skiff and low pro clackacraft drift boats. Skiffs are perfectly designed for those commonly windy days on the Grey Reef. With a profile lower than the traditional low profile drift boats, these drift boats are lighter and easier to row in the wind. Read more on the Clackacraft site about these incredible drift boats! Our shop is conveniently located on the edge of Casper on the way out to the Grey Reef or Miracle Mile. Floating the Gray Reef is made easy with our clean, well equipped, Grey Reef drift boat rentals – at the most reasonable price around! 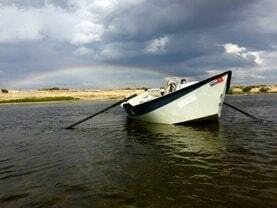 Grey Reef drift boat rental-for the North Platte River- $100 per day. Miracle Mile raft w/ fly fishing frame rental- for the North Platte River- $125 per day. Bighorn drift boat rental- for Thermopolis Wy. – $115 per day. Bighorn drift boat rental- for Montana- $125 per day. 3.) Net. A nice long handled one. 4.) Oars. The light ones guides love not the cheap ones. The drift boat trailer fits a 2″ hitch and has a 4 flat light plug in. 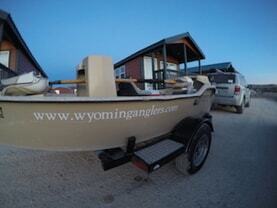 Our drift boats come ready to fish the Grey Reef, Miracle Mile or the BigHorn in Wyoming. If you want to take our drift boats to another river just mention it to our staff. Our fully loaded Grey Reef drift boat rental package takes all the work out of planning and leaves the fun in. Leave the stress at home and pick up a drift boat at our conveniently located shop on the way to the river. 2.) Drift boat on a trailer ready to go. 3.) 2-3 rods fully rigged. 4.) A dozen flies hand picked from one of our guides. 5.) Lunches & drinks on ice. 6.) Net, oars, anchor, pfd’s, etc. 6.) A shuttle of your vehicle and boat from put in to take out wherever you need from Grey Reef to Casper. You come pick up the drift boat from our shop. We will give you some pointers and any information needed to have a successful day on the water. You then haul the boat out to the put-in. You put the boat in the water. You fish until your heart is content and your wrists are sore from reeling. Your vehicle is moved to the take-out during your float. When you get to the take-out, your vehicle and trailer are waiting in the parking lot for you. You load the drift boat on the trailer then bring it back to us as late as you need to that evening. We will do our best to accommodate earlier drift boat pick ups times. Late night drift boat pickups are available by appointment. We have a 2 week cancellation policy. If you cancel after the 2 week period then your deposit becomes non-refundable. If you cancel before the 2 week period then your deposit will be refunded minus 4% of the total deposit to cover the merchant credit cards fees we get charged to run your card. i.e. All cancellations are subject to a 4% fee of the total amount that was charged to the card. After the 4% is deducted the remainder will be refunded. Refunds usually take 2-3 days. No call No show- If you haven’t called us in advance and you don’t show up the day of the reservation, you will be charged the full price of the rental. We understand unforeseen things happen. We always try put ourselves in your shoes to be understanding and we try to live by the Golden Rule. If your courteous to us and let us know your cancelling as soon as you know, we’re usually understanding. If we don’t loose business because of your cancellation we generally won’t charge you. We’re not out to make money we don’t earn. We want your earn your repeat business, year after year. But we do have to have a policy for our protection. With all that said, it is to the sole discretion of Wyoming Anglers if we will refund your money after the 2 week period. We do charge 50% of the total reservation to hold your spot a the time of booking. We reserve the right to put a hold on a credit card until the drift boat comes back in good shape. Me and my buddy were on our way up from Boulder CO to float/fish the reef but we ended up forgetting our oars. Well we called Wyoming Anglers and met the owner Luke who was awesome and totally salvaged our trip from being a complete disaster. He went out of his way to get us a great setup, was helpful about setting up a rig that’s specific to the reef, and even gave me a couple flies! Great boats and a great company run by a great guy. Logan Bowen, Boulder Co.
My friend and I had researched the fishing on the North Platte and decided to make the trip. We are from out of state and had zero experience or knowledge about the river. I contacted another guide company and had several questions about lodging, drift boat rentals, sections to fish and what flies to use. I was promised the world by this other company yet when the week of my trip came around this company would not return my calls and left me high and dry. Luckily I Found Luke’s number with Wyoming Anglers. We landed at the airport in Casper in the evening and by the time we got our rental truck and stopped at the store for supplies, when we made it to the drift boat rental lot it was dark. Luke left his family to come meet us and had our boat ready to go. He even provided a hitch and cooler for us. We were doing a self-guided float trip and Luke provided us with some flies that he recommended and stretches of rivers to fish. He gave us his personal cell phone number and told us to call anytime. We had a great weekend and anytime we had questions Luke was there to help us out. He even did a personal shuttle run for us on the miracle mile something no other fishing service would provide to us. We already have plans to go back to the North Platte this year and Wyoming Anglers is the only company I will book with from now on! If you are smart you will book with Wyoming Anglers they go above and beyond to take care of their customers.